The gallbladder is the primary site of several types of malignant mesenchymal tumors, though all of these neoplasms are extremely rare [1, 2]. Patients usually present with pain in the right upper quadrant of the abdomen with or without jaundice, and generally, poor outcomes are expected [2, 3]. 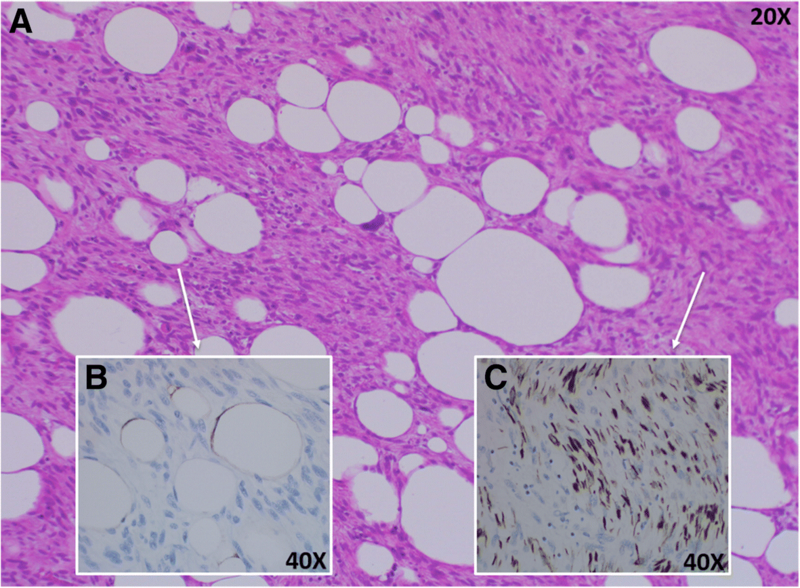 Liposarcoma is the second most common soft tissue sarcoma among adults, and their more frequent sites are the proximal extremities and the retroperitoneum [3–5]. Primary intra-abdominal liposarcomas are rare, and they are more commonly located in the mesentery and peritoneum . These tumors tend to invade nearby structures and to spread within the abdominal cavity . Here, we report a case of dedifferentiated liposarcoma, the first report of this histological subtype in the gallbladder. A 71-year-old woman was referred to the Surgical Oncology Division at the Napoleão Laureano Hospital in João Pessoa, Brazil, presenting with a mass at the right side of the abdomen, associated with fever. She presented dyspeptic complaints and an isolated episode of acute pain in the upper abdomen, with radiation to the back, 20 days before the consultation. At admission, no signs of jaundice were found. An abdominal mass with elastic consistency was palpated at the right hypochondrium, 20 cm below the last rib. Laboratory tests indicated the following measures: hemoglobin 9.5 g/dL, carcinoembryonic antigen (CEA 1.96 ng/mL), serum C-reactive protein (123.8 mg/L), serum alkaline phosphatase (ALP 244 U/L), gamma-glutamyl transpeptidase (GGT 134 U/L), AST, ALT, albumin, and bilirubin within normal range. Abdominal ultrasonography (US) evidenced the presence of a solid, hypoechoic heterogeneous mass, measuring 14.2 × 9.5 × 13.8 cm, located on the right flank of the abdomen. Computed tomography (CT) showed extensive lobular formation (14.7 × 14.4 × 10.5 cm), exhibiting irregular enhancement and areas of fat density in the right side of the abdominal cavity, without cleavage plan with the gallbladder. The mass was adherent to the inferior border of the right hepatic lobe, bulging the ipsilateral abdominal wall and compressing the transverse colon, modifying its anatomic position (Fig. 1a). Three large gallbladder stones were identified (Fig. 1b, c). The CT report suggested gallbladder liposarcoma and cholelithiasis. Thoracic CT scan was normal. Based on these findings, on 3 February 2018, a laparotomy was indicated. An extensive gallbladder tumor associated with focal liver invasion was observed (Fig. 2a). The cystic and biliary ducts were free from neoplastic invasion, and there were no signs of peritoneal spread nor of other organ metastases (Fig. 2b). 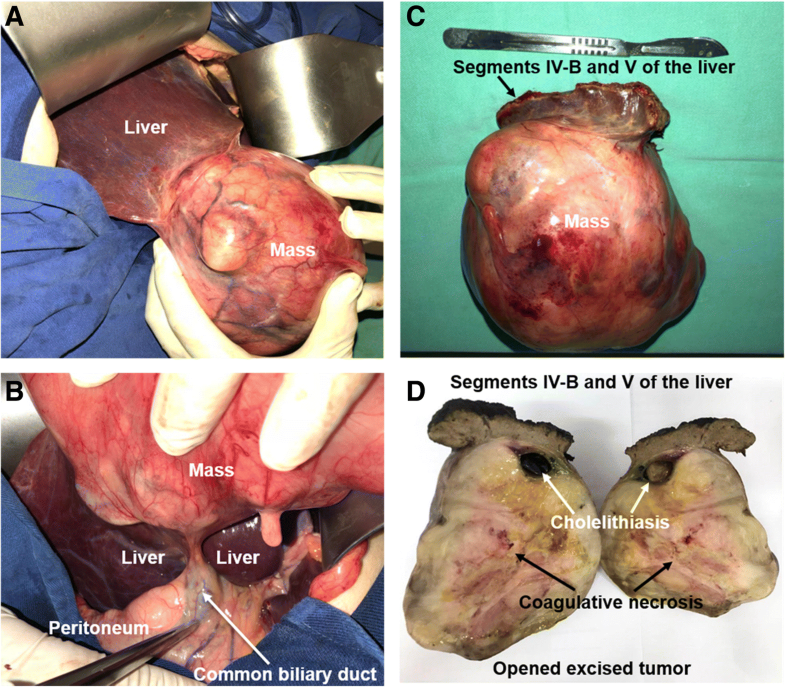 A cholecystectomy associated with resection of segments IV-B and V of the liver was done (Fig. 2c). Intraoperative frozen sections of the opened excised tumor (Fig. 2d) were compatible with gallbladder sarcoma. Therefore, transoperative lymphadenectomy was not performed. The patient was released 7 days after the surgical procedure and the anatomopathological examination and immunohistochemistry confirmed dedifferentiated liposarcoma (Fig. 3a) with foci of heterologous leiomyosarcomatous differentiation (Fig. 3b) and undifferentiated fusocellular areas of high histological grade (Fig. 3c), stage T3N0M0. Other immunohistochemical staining were studied, such as Pan-cytokeratin (AE1/AE3), epithelial membrane antigen (EMA), and high molecular weight cytokeratin (34betaE12), in order to refute the possibility of a carcinosarcoma of the gallbladder. All of them were negative. At 8 months after the procedure, the patient is free of disease, presenting no signs of recurrence nor metastasis (Fig. 4). Liposarcoma of the gallbladder is one of the least common sarcomas , with only five cases reported in the literature according to our knowledge (Table 1). The mean age at diagnosis of LPS among the five cases reported in the literature and ours is 67.17 ± 10.11 years, and there is a prevalence of 83.33% of female patients. The WHO classification for soft tissue neoplasms divides liposarcoma into four types: atypical lipomatous tumor (ALT), myxoid liposarcoma (MLS), pleomorphic liposarcoma (PL), and dedifferentiated liposarcoma (DL) . This classification reflects the spectrum of presentations of these diseases related to clinical progression, therapeutic sensitivity, and morphologic features . Regarding the localized disease, surgical resection with clear margins remains to be the mainstay of treatment for LPS [5, 7]. The use of systemic therapy does not improve the course of the disease, except in cases of MLS, which is more chemosensitive and radiosensitive than the others subtypes [5, 8]. Similarly to the PL, the DL is a high grade and aggressive tumor, typically chemoinsensitive and radioinsensitive, in which cases the benefit of systemic therapy has been reported to be minimal [5, 7]. Livingstone et al. assessed the response of retroperitoneum DL to chemotherapy by the traditional RECIST (Response Evaluation Criteria in Solid Tumors) criteria in addition to an exploratory analysis of vascular alterations within the tumor. Using this methodology to assess response, they found that, in some selected cases, such as recurrent disease and unresectable tumors, DL can benefit from a combination chemotherapy . 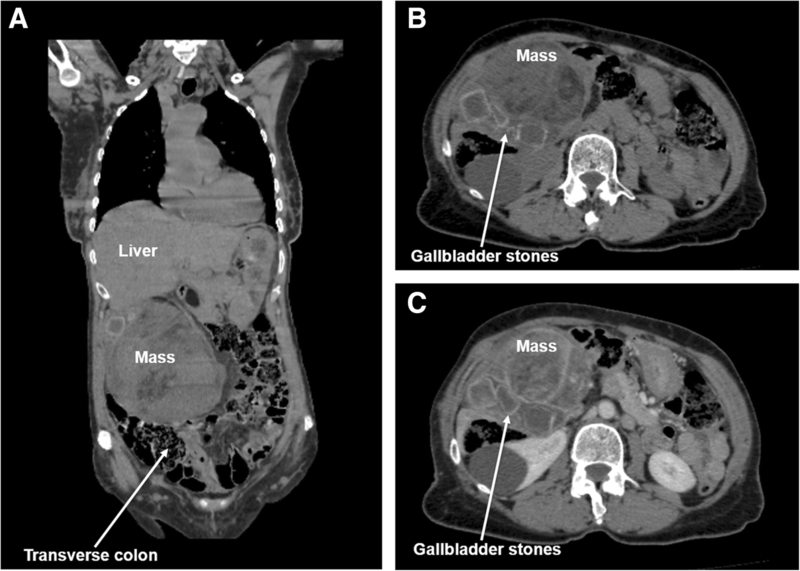 The prognosis of patients with gallbladder liposarcoma is poor, because these are tumors with an aggressive behavior and, generally, present high rates of recurrence and metastasis . Taking this scenario into consideration, it is expected that, in the future, the patient of our case may require further surgical procedures in order to resect possible sites of metastasis, such as happened in the cases described by Hamada et al. and Bader et al. . The main limitation of our case is the fact that we do not have a longer term follow-up of this patient. Therefore, we could not determine the prognosis of the case. To sum up, among the five cases of gallbladder liposarcoma ever reported in the literature to date, only two histological types were identified (one PL  and four MLS [3, 10]). Our case stands as the first case of subtype DL of the gallbladder to be reported. As a case report, all data generated or analyzed are included in this published article. ACC and AL designed the report. NL and BFS collected the patient’s clinical information. AABF analyzed the patient’s data. ARP performed the pathologic analyses. FSC and JLF wrote the paper. All authors read and approved the final manuscript. The patient provided written consent to publish this case report.